"Nothing brings the family together like a warm dish straight out of the oven. Try this timely twist on a classic." Combine chicken, artichokes, tomatoes, 1 cup mozzarella and Parmesan. Beat cream cheese, milk, and garlic powder with mixer until well blended; stir in 2 tablespoons basil. Mix half with the chicken mixture. Spread half of the remaining cream cheese sauce onto bottom of 13x9-inch baking dish; cover with 3 noodles and 1/3 of the chicken mixture. Repeat layers of noodles and chicken mixture twice. 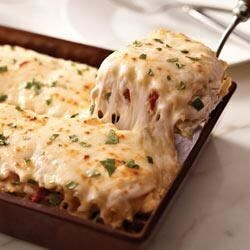 Top with remaining cheese sauce and mozzarella; cover. See how to make cheesy baked chicken ratatouille with fresh garden herbs. Cook's Note: Spray the foil with cooking spray before using to cover the lasagna to help prevent the foil from sticking to the cheese on top of the lasagna. Items in it were tasty, but the lasagna was a little too dry. I would have liked a more creamy/cheesy middle sauce. My husband said that it was MUCH tastier as leftovers the next day. This was very good. Next time I may add some mushrooms. Maybe reduce the cream cheese and add more milk. I didn't find it dry. I wonder if the people who said so had not covered it. Next time I'm going to use less artichoke, and with the diced tomatoes change to Mild Diced tomatoes with green chillies ( husband said it need a little extra flavor ) otherwise great recipee!! !